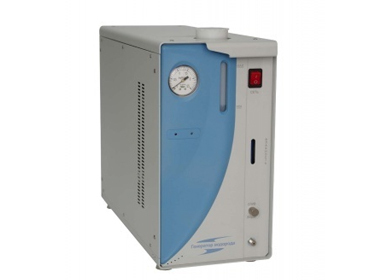 Hydrogen generators are designed to produce hydrogen decomposition of distilled water. Electronic Stability provides high stability to maintain pressure in the course of their work. Models 6.140, 10.140, 6.400, 10.400, 16.600 and 25.600 produce hydrogen, intended to supply the analytical instruments: gas chromatographs with fiery detectors, gas detectors and so on. D. Generators are two stages of cleaning: a separator and filters with a molecular sieve, prevent the release of moisture gas lines. The output indicator is set humidity. Models "OFS" have a higher purity of hydrogen produced, it can be used as a carrier gas chromatographic studies.Generators have four stage hydrogen purification: separator, condensed moisture dryers, filters, molecular sieve and a catalytic reactor, excluding the possibility of the presence of impurities of oxygen and release of moisture in the gas lines.The output indicator is set humidity. Power supply of the hydrogen generator is carried out by AC frequency 50 Hz ± 1 220 V.